Russian social activists have launched an initiative to replace gruesome graphic images on cigarette packs with positive messages motivating smokers to quit. 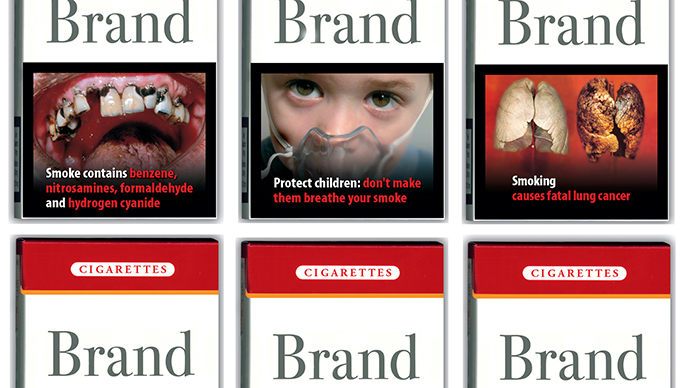 A positive spin on tobacco product warning labels will be more effective, they believe. The current practice of straightforward warnings about the health risks of tobacco use terrifies smokers, but does not help them quit the bad habit, activists say. To replace the messages and images of rotten body parts, they have started collecting votes on the official "Russian Social Initiative" online source. Positive messages with promised gains rather than losses, along with information on assistance in quitting smoking is a more effective approach in reducing smoking rates, they believe. The initiative suggests to place such messages as "You’ll save at least 15,000 rubles ($280) a year by quitting smoking" and "Eating fresh vegetables and fruits, exercising and walking in fresh air reduce the need for cigarettes." The common disturbing images on cigarette packs "darken the mind" by making a person think about serious illnesses, the petition says, adding that it doesn't help in quitting. Many smokers just turn over the pack so as not to see the warnings, making them useless, the activists said. Russia's Health Ministry will study the proposal should it receive at least 100,000 votes by March 2016. At the same time, both types of messages can’t be placed on the same pack, ministry official Tatyana Klimenko told M24 channel. "According to neurolinguistic laws, negative and positive information cannot be put together. The negative message will just swallow the positive one, which will not work at all," she explained. Meanwhile, the Health Ministry is currently working on a new set of terrifying images to demonstrate negative consequences of the smoking habit. Over a dozen photographs, including the corpses of people killed in fires in their own apartments, will soon appear on cigarette packs in Russia. Graphic warnings on tobacco packages were introduced in Russia in 2013, but the current images of dead babies, cancer risks and loss of sexual power need to be replaced with new fear appeals in order to keep the campaign's effectiveness, officials believe. "The longer you smoke, the less sensitive you become to images of consequences," Dmitry Yarin of the International Confederation of Consumer Societies told Izvestia newspaper. While teenage girls will be shocked by fearful images, the same warnings would have no effect on 40-year-old smokers, Yarin said, adding that smoking men are most deeply affected by cautions about erectile dysfunction.